The poolside or beach is a place for relaxation and rehabilitation. If you manage a pool or resort, you know the wonderful amenities it offers, and whether you're interested in doing a complete makeover or just adding a few accessories to enhance your guests' experience, we've got everything you'll need to make it happen. This buying guide is designed to walk you through the various commercial grade pool furniture options available to help your guests get as much joy as possible from their favorite location, in or out of the water. Resorts all around the world feature scores of lounge chairs lined up along the poolside or beach shore, most filled with relaxed guests. This really goes to show how important it is to provide your guests with high quality, comfortable lounge chairs that are easy to maintain and will last for years to come. All of the slings including resin wicker can be power washed for easy maintenance and they're all stackable! 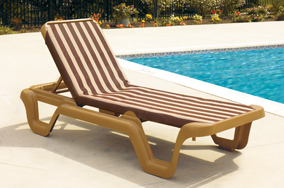 If you're looking for that resort feel then the Nautical sling chaise lounge chair is the answer. This popular design appears at hotels and resorts all over the world, meaning it has withstood the test of time and continues to be a winning choice. Elastic Cord for Sling Shape Retention. UV Stabilized Molded Resin Base. ASTM F1988-99 Tested to 400 Pounds. 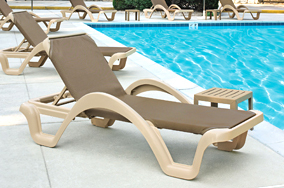 To up the comfort level, your guests will definitely enjoy the Catalina chaise lounge chair with contoured armrests. 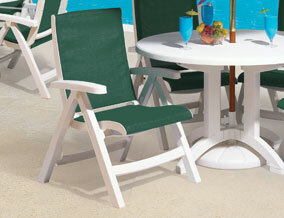 Its sturdy frame also allows it to remain stable on a sandy beach. 5-Position Adjustable Back (Lays Flat). The Marina sling chaise lounge is very similar to the Catalina but it's easier to get in and out of since it's designed without the armrests. The Calypso and Java lounge chairs are the best of both worlds, featuring a versatile base made to be used on both hard and sandy surfaces. The sling is held in place by a powder-coated aluminum frame instead of an elastic cord. The Calypso gives you the most value for your money, it's durable and easy to ewmove & replace sling in the blink of an eye. 4-Position Adjustable Back (Lays Flat). Replaceable Vinyl Coated Polyester Sling. The Java features a high strength resin wicker fiber seat for an upscale look. Highly flexible for comfort, and resistant to color fading, cracking, peeling, and breaking. Replaceable VIRO® Resin Wicker Fiber. ASTM F1988-99 Tested to 300 Pounds. Specifically made for commercial use, the Bahia lounges offer twice the resistance to UV degradation than the ordinary market chaise. Built-in safety guard prevents finger injuries caused by accidental fall of the adjustable back and longer sleigh glides prevent accidental front tilt. Recessed Wheels and Long Footpads. Rounded Edges and Reinforced Slats. 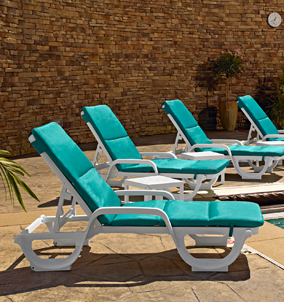 The Bahia cushions are a cost-effective way to upgrade your Bahia lounge chairs for extra comfort and to liven up the furniture on your pool deck with vivid colors. 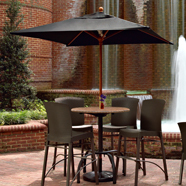 Specifically designed for comfort and low maintenance in hospitality use. Fabric has excellent shape retention, resists mildew, absorbs virtually no moisture, dries quickly after a summer shower and is easy to clean. Cushion from Sliding Off Chaise. (27% Olefin, 14% Polyester, 60% PVC). 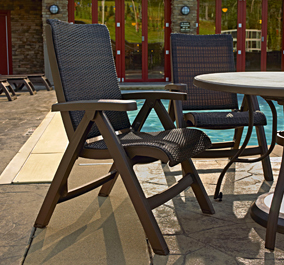 For your guests that may have a hard time getting in and out of lounge chairs, or to provide a place for people to relax near the poolside at a table setting, the midback folding chairs are the perfect solution. 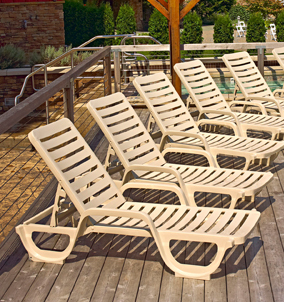 Commercial grade chairs such as the Belize and Jersey Midback or Java come with the same water-resistant sling as their lounge chair cousins. They are easily foldable for storage and can be power washed when needed. 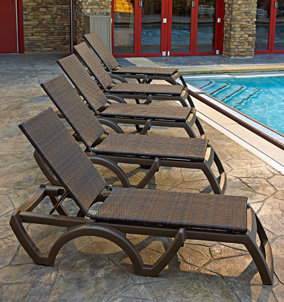 The Belize midback folding chair features a replaceable sling available in a variety of colors to match with other pool furniture or décor. UV Stabilized Molded Resin Frame. Locks to Secure Chair in Position. EN 1728 Rated to 300 Lbs. The Jersey midback folding chair is a cost saving option with a permanently attached sling. 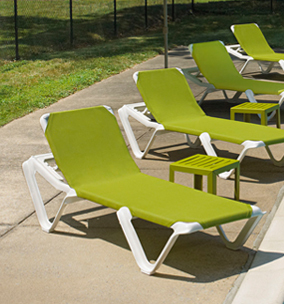 The Java folding chair will give your poolside setting that upscale, sophisticated touch, and the colors coordinate with the Java chaise lounges. Available in Espresso or Honey wicker. 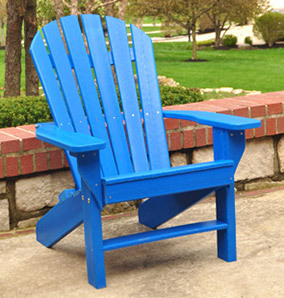 Seaside Adirondack chairs may be just what you are looking for if you need chairs made to commercial grade standards. These chairs are built from the highest grade, 100% recycled plastic and feature a higher seat height for easy entry and exit, a six-slatted contoured back for extreme comfort, stylized armrests, and heavy-duty legs. Marks from pens or paint, can be removed with sandpaper. Surface cuts and scratches can be ironed away. These chairs are held together by marine-grade stainless steel hardware. Ottomans and side tables are also available. 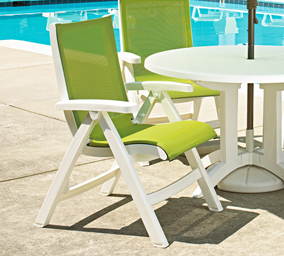 If your poolside or patio features Adirondack chairs, then the matching recycled plastic side table or tete-a-tete is the perfect accessory to provide some extra space to set a plate of food while relaxing. For resin lounge chairs, matching low side tables like the Bahia, Miami, or Oasis will give guests a convenient place to set magazines or drinks. These low tables are made from a durable, commercial grade resin available in colors to match your lounge chairs and sold in bulk to save you money. The pool itself doesn't have to be the only place for your guests to cool off in the hot summer sun! You can cover a large area with just a single umbrella like the Super Large Shade Canopy. This massive umbrella is available in sizes of 12, 14 and 20 feet in diameter supported by a 4" diameter aluminum pole which is securely placed in a permanent ground sleeve. The winch and cable are mounted internally and the umbrella can be raised or lowered by using a removable crank. 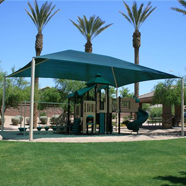 To protect a larger space, such as an eating area, shade structures are a great solution. 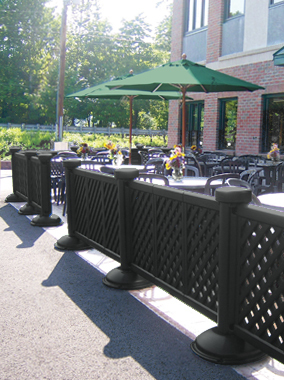 The posts are permanently mounted into concrete and available with weather resistant canopy, steel, or aluminum tops in a variety of colors. 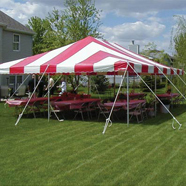 For events, commercial grade portable party tents can be easily set up and taken down as needed and range in sizes from 7' x 7' to 20' x 40'. 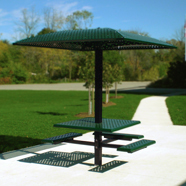 Some outdoor picnic tables and benches are available with permanently attached shade structures. It's the perfect solution for scattered tables or areas too large to be covered with a single shelter. 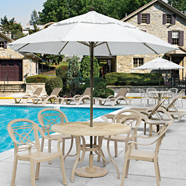 Umbrellas are a must have for poolside dining. 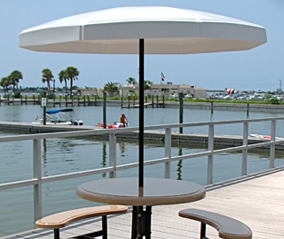 Market umbrellas refer to a 7' to 9' round or 6-1/2' square style with a vented fabric canopy top and a 1-1/2" Dia. or 2" Dia. wooden or aluminum pole. They are typically placed at the center of a patio table, or they can be left freestanding by securing to a special base for placement on a flat and sturdy surface. Alternatively, umbrellas with the aluminum pole can be anchored into sand using a beach bottom attachment. 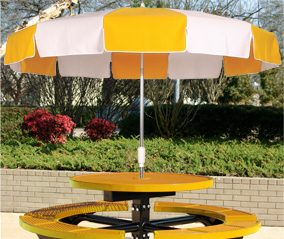 Market umbrellas can also accommodate bar height tables by utilizing a push-button extension pole. Vinyl umbrellas come with a sturdy 1-1/2" Dia. anodized aluminum pole, crank lift, and tilt feature. They are 7-1/2' or 8-1/2' in diameter and are available in a solid color or two alternating colors. 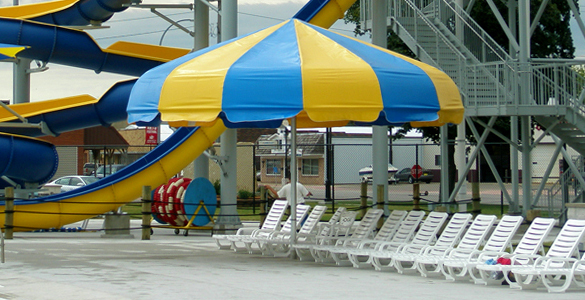 Fiberglass umbrellas come in several different shapes and heights. 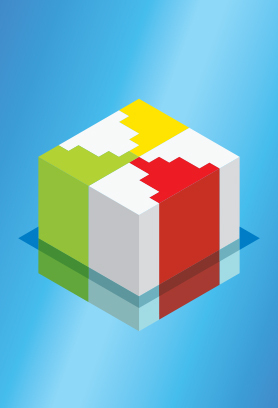 Some can be ordered with two alternating colors as well as logo application. The 1-1/2" Dia. pole is available in black or white with a 6' or 8' height. Where there's water and slippery surfaces, falls are a potential danger. 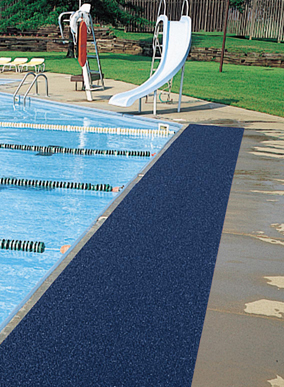 Wayfarer outdoor mats have a vinyl-loop design that provides traction while removing dirt and moisture. These mats are specifically designed to dry quickly and resist mildew buildup. Available in custom sizes to fit any need. For locker rooms and showers the Safety Grid® Anti-Fatigue Mats utilize a welded duckboard design that creates an elevated platform for safety and keeps traffic away from moist floor surfaces. 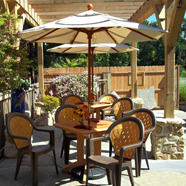 Portable decorative patio fencing can be used to separate eating areas or block off restricted space. The fencing is made of 100% prime resin making it resistant to fading. You can fill the posts with sand or water or even anchor them to the ground to provide added stability. At the end of the season, the fencing can be easily broken down for storage. For areas under construction or places that need to be temporarily blocked off, Movit® safety barriers can be interlocked to create a wall to your specifications. These barriers are also lightweight, environmentally friendly and available in six bright colors to signify caution.